We provide Software Products and Consulting Services related to Quality and Regulatory compliance to our customers in the Medical Device, Diagnostics, and Pharmaceutical industries. Process Validation and Test Method Validation Software -- Now Available!  Full web application versions of InfoAudit and InfoPV are now ready to order! Click here for more information on InfoPV. Latin America offices in Costa Rica since 2011. MyFDA Academy e-Learning Center is now online! MyFDA Academy is an e-learning center where people involved in the medical device, pharmaceutical, and biotech industries can take online training courses on a variety of topics relevant to the Quality Management System and/or Regulatory Compliance aspects of these industries. Check it out here.